In 1750 the grapefruit (botanical name citrus x paradisi) was first described on Barbados. Today South Africa is one of the main growing countries. The fruit is growing best in a warm subtropical climate. 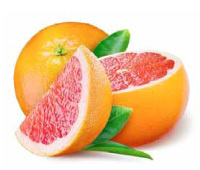 Grapefruit comes in many varieties, determinable by color, which is caused by the pigmentation of the fruit in respect of its state of ripeness. The most popular varieties cultivated today are red, white, and pink hues, referring to the internal pulp color of the fruit. The family of flavors range from highly acidic and somewhat sour to sweet and tart. Products out of grapefruits should have a characteristic fresh flavor with a typical grapefruit taste and without an off-taste. Very important characteristics are the acidity and the pulp content. Low ratio (<8,5) is a sour quality whereas a high ratio quality (>8,5) is sweet. What the pulp content is concerned you have to distinguish between low and normal pulp content. A low pulp quality has a pulp content of max. 2-3% and all other qualities with higher pulp content are declared as normal pulp quality. The naringin parameter is also an important factor for grapefruit juice concentrate. This value states how bitter the product is. The white skin between peel and flesh contains this bitter naringin. The white grapefruit is nearly round with a yellow peel. The pale yellow flesh is very juicy and sweet to sour with a slight bitter after taste. The red grapefruit is nearly round with a yellow to reddish peel. The pink or deep red flesh is very juicy and sweet to sour with a slight bitter after taste. The Star Ruby variety is the darkest of the red varieties.